City Council OKs money for police video cameras: Installation in 27 patrol units expected by February. The Santa Barbara Police Department will soon have video cameras in 27 patrol cars and four interview rooms. The City Council on Tuesday approved spending about $208,000 on WatchGuard Video cameras and about $23,000 on camera installation by Global Mounting Solutions Inc. The council had already budgeted the expenses for fiscal year 2012-13, said Dennis Diaz, police information technology manager. Capt. 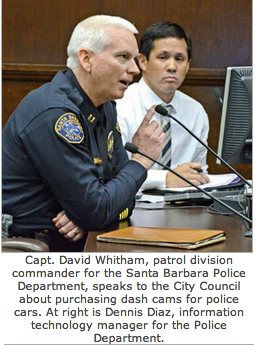 David Whitham, patrol division commander, said some officers may be concerned about “Big Brother” looking over their shoulders.The Santa Barbara Police Department will soon have video cameras in 27 patrol cars and four interview rooms.The City Council on Tuesday approved spending about $208,000 on WatchGuard Video cameras and about $23,000 on camera installation by Global Mounting Solutions Inc.
“However, in most cases (video) exonerates police from wrongdoing instead of catching them.” The high-definition video and audio files will be stored on servers at the police station in a secure room. Only limited personnel will be able to access the room, Capt. Whitham told the News-Press. The video is public record, said City Attorney Steve Wiley. Prompted by the DUI arrest of investigative journalist Peter Lance, the Santa Barbara County Grand Jury released a report in October 2011 calling for all county law enforcement agencies to install video cameras in their patrol vehicles. 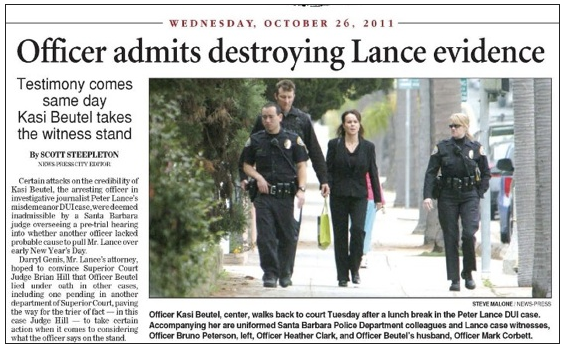 Lance’s case was dismissed on November 15th, 2011 and the DMV returned his license in March of 2011. Last year the News-Press published a 13 part series by Lance alleging that Santa Barbara police officer Kasi Beutel had arrested him and a series of other drivers for DUI crimes they did not commit. The City, to date, has taken no action against Officer Beutel. One of the first test video cameras captured the controversial Oct. 21, 2011, DUI arrest of Tony DeNunzio in Loreto Plaza who was Tasered 13 times by SBPD Officer Aaron Tudor. Witnesses accused Tudor of using excessive force and the video provided evidence in the case. But Santa Barbara District Attorney Joyce Dudley refused to bring charges against Tudor, who is head of the City’s Drinking Driver Team. At the Feb. 28 City Council meeting, Police Chief Cam Sanchez told the council the Police Department would select a camera vendor by April 2012. The department selected WatchGuard in October and should have the cameras installed by the end of February, Mr. Diaz said. WatchGuard’s system features forward- and rear-facing cameras, wireless video uploading, high-definition video and audio recording, and easy operation, he said. “Some events will not happen in perfect range of the camera,” but in those cases the HD microphone can record sounds as far as 1,400 feet away, Mr. Diaz said. The HD video will be able to read license plates as much as 38 feet away, compared to regular video that can read license plates at 15 feet, Mr. Diaz said. In addition, the video system has event tracking, which can chronologically track police car activity, including the car’s speed and when lights and sirens are turned on and off, he said. In the future, the system could stream video from patrol cars directly back to the police station, Mr. Diaz said. 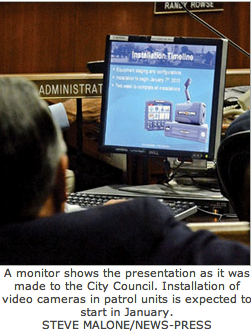 “We are building this system to retain as much (video footage) as possible,” he told council. The Police Department plans to store video at the police station for about one year. Footage needed for court cases or as evidence will be kept “forever,” said Capt. Whitham. “Having video on-hand makes it easy for supervisors to review and handle complaints,” said Sgt. Riley Harwood, spokesman for the Police Department. This is not the first time the department has used cameras in patrol cars. About half of the department’s cars had cameras for three to four years starting in 1999, Sgt. Harwood said. After the department installs the new system, it will most likely hire another full-time employee to help maintain camera hardware and process evidence requests, Mr. Diaz said. Police motorcycles may get cameras in the future, Capt. Whitham said.